Back Design Mirrored design of four faces in oranges and blues. Structurally the deck follows the usual pattern, there are 78 cards divided into trumps and suits, Justice is numbered VIII and Strength is XI, the fully illustrated suits are named and numbered in the normal manner and the courts include the standard Knave, Knight, Queen and King. Each card features the multi lingual titles favoured by Lo Scarabeo on an indigo border the colour of twilight. These borders are carried over on to the fully reversible backs where they surround an image that picks up colours and themes from the face of the cards. The illustrations for the majors will, for the most part, be familiar enough to most tarot readers. They comply with enough of the standard symbolism, such as the Scales of Justice and the Angel of Judgement, to be recognisable without much difficulty while still retaining the power to surprise thorough their novel interpretation of these familiar symbols. The minor arcana follow the RWS images to a certain degree. 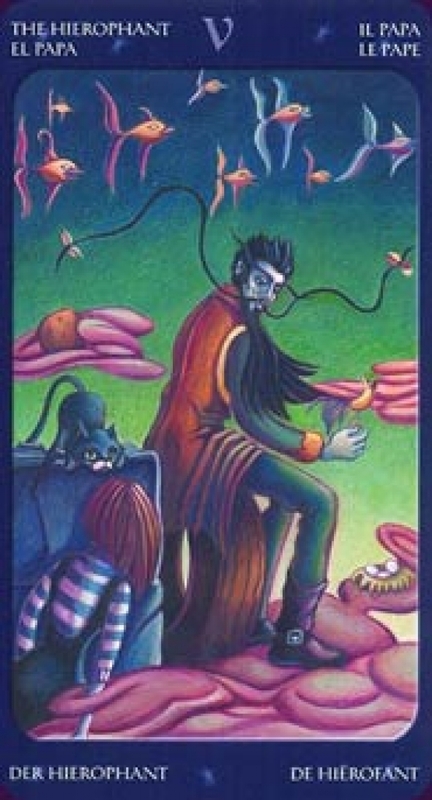 In some cards the influence is obvious to see as in the 7 of Wands or the 3 of Swords, in others it is more difficult to discern the relationship and in some, such as the jack in the boxes on the 7 of Pentacles it seems impossible to make a connection between the decks. The court cards in particular appear to be wholly original in their depiction of character and scene, although the Knights do all feature some form of steed, however strange. Unusually there appears to be no theme or elemental association tying each suit together and differentiating it from the others, it is as though each card must be taken as an individual or as part of the deck as a whole. His impression of wholeness is enhanced by the use of the same colour palette throughout the deck. Rich, deep hues predominate; blues, greens and oranges, the colours of sunset and of twilight. This unifying effect is further compounded by the use of the identifying suit symbols. These are worked into the design of each card, often in quite subtle ways such as the posy of pentacle flowers held by the woman on the 10 of Pentacles, and can make quick identification of each card difficult, especially as the suit name is only present on the card in the small font of the multi lingual titles. This gives the interesting effect of forcing the reader to study the image rather than relying on written titles to identify the card and trigger interpretation. This perhaps is intentional; for Sweet Twil ight is a deck that is intended to be intuitively as the pictures are contemplated and allowed to speak to the readers heart and mind. Indeed, the booklet that accompanies the deck asks the reader to ‘Try using the cards without reading the interpretation first’, and when the interpretations are read it will be found that they are, as often as not, phrased in the form of questions that prompt the reader into studying the card more closely and drawing their own answer from that which they see. Christina Benintende’s artwork for this deck is perfectly suited to intuitive reading. Instead of relying on elemental, astrological or cabbalistic symbolism she has instead evoked an enigmatic world balanced on the cusp between light and dark, day and night, between wakefulness and sleep. This deck is filled with what can only be described as a wealth of personal symbolism that cannot be decoded through any logical or systematic method but must instead, in this magical world that lies on the borderland of dreams, be discovered in the depths of ones own heart. It is a tribute to the artist’s skills that these 78 pictures succeed in their aim and are able to touch the soul of the reader so deeply. The intuitive reader will find much to work with in this lovely deck. Benintende’s art contains many mysteries to be puzzled over, themes in one card reoccur in another giving hints toward the artist personal symbology. Suns and moons appear with regularity, as do masks, books, butterflies and hearts. People and animals appear as toys, scarecrows and puppets as they form and twist, becoming part of their environment or being born from it. These and other mysteries are no, perhaps cannot, be explained; it is left up to the reader to interpret what, if anything they mean in the context of a reading. In some ways therefore this is a deck of secrets. What, for instance, is the meaning of the mice The High Priestess holds? What is their relationship to the cat that appears on the same card? Are the Fish in the Hierophant card swimming in the air above the people’s heads, or are they beneath the water in which the fish swim? All these questions, and an infinite number of others, are asked by these cards and, as the reader explores them the answers can be expected to change. In this shifting world of mirages no answer is certain or true for all times and all questions, as dreams or as clouds they move and change as the mood takes them. One of the strongest aspects of this deck and of Benintende’s art is the depiction of individuals characterised upon these cards. The people who inhabit this twilit dreamland, however strange and ethereal, appear to be fully formed individuals whose poses and expressions speak clearly to the reader of their feelings and emotions. Some seem aware that they are being observed and stare directly out of the card to boldly meet the observers eye, others shyly avert their gave, while some, enthralled by their own activities, seem oblivious of the reader who watches them. Although deceptively simple these cards have hidden depths. On the surface the childlike images project an impression of fairy tale innocence, but, like all the best fairy stories, a closer examination reveals an undercurrent of darkness that flows beneath the surface. There is a strange eroticism to many of the images and a willingness to embrace or even enjoy the sorrows that life brings. And again, beneath this darkness, lies a vein of tenderness where the sorrow is soothed and healed. In no card is this more apparent than in the stunningly realised Death card wherein the charmingly skeletal figure of death, his shadow forming the shape of a scythe, bears the body of a young woman in his arms as he carries her across a barren desert, holding her with love and gentleness as he takes her beyond the shadowed borderland of mortality. The Tarot of the Sweet Twilight is a beautifully compelling creation; it carries just enough familiarity to make it accessible while at the same time providing enough originality to make it a pleasure to explore and a challenge to read. However, without a doubt, this deck is intended for intuitive readers and is most likely to prove of value to those who wish to discover for themselves what the cards mean. For those who prefer to learn from books and to be told what the cards mean this deck may present some problems as the artists personal symbolism is often obscure and the accompanying booklet asks far more questions than it answers. Nevertheless most people would be able to enjoy these delightful images and for those new to intuitive reading, but who are willing to try this method, these cards with their attractive images and depths of emotion would be an idea place to start. However it is used The Tarot of the Sweet Twilight is a beautiful deck quite unlike any other. Its mixture of innocence and melancholy give a perfect combination of accessibility and depth that draws the reader into Benintende’s evocative world and enthrals them with its mystery, delight and sorrow. Though possibly not to the taste of all readers this is an enchanting deck whose images give many new and original depictions of the ideals and ideas contained in the 78 card of the tarot.